This is the perfect all-day tour if you're on Oahu and you want to visit a neighbor island that is entirely different from where you're staying. This daylong trip departing from Kona, showcases the Big Island’s breathtaking diversity—from lush tropical rainforests to world-famous coffee fields to volatile volcanoes. 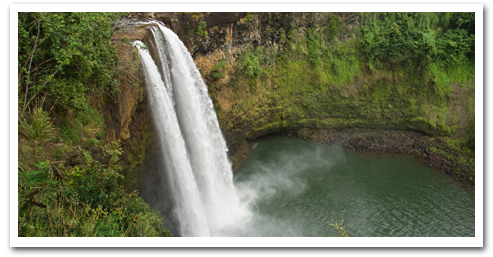 The wraparound island adventure begins at Parker Ranch, then travels to Rainbow Falls State Park, Hawaii Volcanoes National Park, Punaluu Black Sand Beach and past the world-renowned Kona coffee fields. At the first stop at Rainbow Falls State Park, soaring waterfalls cascade from a natural volcanic backdrop. Next is a visit to Big Island Candies, famous for its chocolate-dipped, macadamia nut shortbread cookie. You will visit Of course, an exploration around the Big Island would hardly be complete without a visit to Hawaii Volcanoes National Park to encounter Kilauea, one of the world’s most active volcanoes, and Mauna Loa, the most massive volcano on the globe. Seeing these untamed volcanic wonders will leave you in awe of nature’s brute power and give you a deeper understanding of the island’s colorful, volcano-inspired legends. After leaving the park, the tour heads to Punaluu Black Sand Beach, where sea turtles often nest, then you will be off to see the world-renowned Kona coffee plantations. 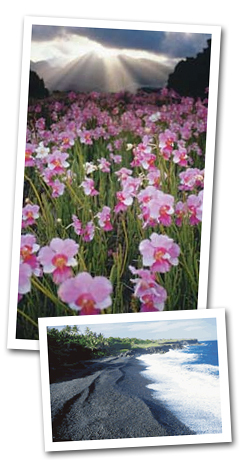 The adventure winds down with gorgeous scenes of Kealekekua Bay, the first place Westerner Capt. James Cook landed in the Hawaiian Islands. A truly unforgettable experience! **Once purchased, this tour fee is NON-REFUNDABLE and the tour cannot be cancelled. Due to airline restrictions, passenger name changes are not permitted under any circumstance, and switching airlines may not be an option. Airline change penalty fees may apply and vary by airline and fare type. Prices are subject to change due to an additional transportation fee depending on your hotel pickup location. Price is inclusive of airfare. Door-to-door pickup in Waikiki beginning at 6:30 AM, returns to Waikiki at 10:00 PM. If providing your own transportation, please be at the airport no later than 7:15 am. All times are approximations. Your safety and comfort are our #1 priority. Tour highlights are subject to change without notice and may vary at tour driver discretion in order to take into account National Park Service advisories, weather advisories, traffic advisories, road closures and detours, venue hours of operations, etc. 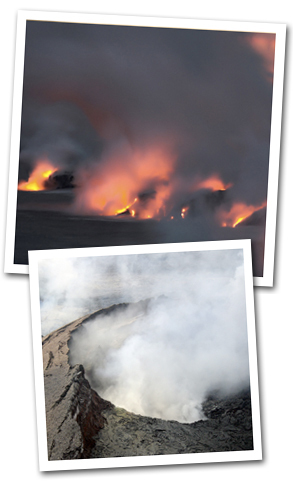 Tour features can change daily as we cannot predict weather and lava viewing conditions. Wear walking shoes, bring a light jacket, and dress comfortably. Lunch will be available for purchase. Route may be modified due to National Park Advisories. Tour highlights are subject to change without notice and may vary at tour driver discretion in order to take into account National Park Service advisories, weather advisories, traffic advisories, road closures and detours and venue hours of operations. Volcanic fumes can be hazardous. This tour is not recommended for visitors with heart or breathing problems and infants, young children, and pregnant women. If you require any special accommodations due to disability, please include them under the comment section at the time of booking. If you require a wheelchair accessible vehicle, the type of wheelchair must be included in the comments section when booking online or by directly calling us at (808) 721-1552. Due to limited availability, we require that ADA vehicle reservations be made a minimum of 48 hours prior to date and time of service. We will make all reasonable attempts to accommodate the needs of disabled travelers. All guests must bring a valid ID for airport security check-in. International guests must bring a valid passport for airport security check-in. No Shows will incur full charges. NO REFUNDS. *** Once purchased, this tour fee is NON-REFUNDABLE and the tour cannot be cancelled. Due to airline restrictions, passenger name changes are not permitted under any circumstance, and switching airlines may not be an option. Airline change penalty fees may apply and vary by airline and fare type. A travel representative will reconfirm your dates and give you your pickup information at least 48 hours before the tour/activity. If there are any problems with your dates, we will contact you. If you have any questions, please click here to contact us. Mahalo!